Take 1,5 cups of all the baking rest that did amass over time in your cupboard. If you have more (I bet you do! ), just take your favourites. Then, take 1,5 cups of savory snacks, preferably also rests and leftovers you want to get rid of. Mix a very simple cookie dough (butter, sugar, eggs - the classics), chop the mentioned leftovers in. Cool the dough, put them in the oven and that's it. The recipe can be found here. 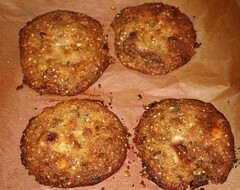 Originally, they are Momofuku's Compost Cookies. David L. calls them Amnesty Cookies - and idea I find hilarious. I halfed the recipe, and found out that I had to limit myself indeed. 3/4 leftovers are not that much at all. In the end, I mixed up some chocolates (a very small piece milk chocolate, a very small piece white lemon chocolate, some pure white chocolate, some mini milk-chocolate-nougat easter eggs, a bit of dark ginger chocolate), mascarpone nougat, shredded coconut, and a little piece of merengue that was left from icecream-making last week. 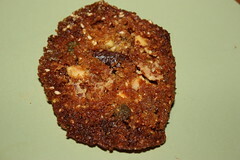 I didn't really have savory snacks at home, so I tricked a bit and took cookie crumbles from various projects (at least I can claim that some of them came from vary salty batches...), which I filled up with pumkin seeds and sesame, and I was very liberal with the amount of salt. I exchanged some flour (only 1/8c) for grounded hazelnuts, which I think was a good idea, and more exchange would not have been a big deal. The real deal is to chill the dough thoroughly on the baking sheet you want to bake with (otherwise they would loose their shape), and after baking to cool them down, still on the rack or at least on the baking sheet (because they need some time for post-baking-congealing). After fridging for about two hours and a very limited baking time (9 mins), and then waiting for cooling down, I eagerly tastes and found them... well, ok. Interestingly, I am not overwhelmed. Maybe because I was too timid with the ingredients. I guess it is really worth trying them with pretzels, and chips and other strange ingredients. Maybe pumpkin seeds are not that a good idea. Maybe.... I don't know. I like all the ingredients a lot, but the combination doesn't work for me. It's not that I don't like these cookies at all. But compared with my expectations (maybe that's the ultimate problem), they stayed far behind. Nevertheless - they are just a perfect opportunity to get rid of your leftovers, so I guess I should give them a second try!